Walk in My Shoes simulates what refugees and immigrants experience upon entering the U.S.
An estimated 50,000 refugees enter the U.S. each year, says John Ward, Missions Mobilizer with Encompass World Partners. Many of them enter through “gateway” cities like Atlanta, he says, though he is aware of smaller cities, like Fort Wayne, Ind., that attract significant numbers of immigrants. “We’re commanded to welcome the alien and the stranger,” he adds. It’s one of the reasons he and his wife, Kate, are leading one of several Mobile Learning Labs during the national conference of the Fellowship of Grace Brethren Churches next week. 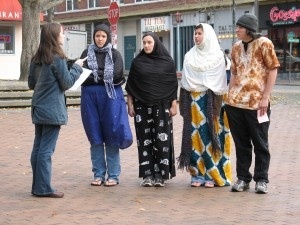 “Reaching out to Refugees,” scheduled for Monday, July 29,will provide a simulation experience, “Walk In My Shoes, where participants will be subjected to events that might happen as a refugee arrives to live in the U.S. – completing paperwork, learning an unfamiliar language, seeking medical care, finding a job, etc. There is still space available for conference registrants to attend the workshop. Thursday is the last day to register online for the Lab and ensure participation. After Thursday, interested participants may sign up when he or she arrives at Vision2020 South in Atanta. “Business as Missions: Doing Good through Social Innovation“(Tuesday, July 30) will visit the nonprofit Plywood People, founded by author Jeff Shinabarger (More or Less: Choosing a Lifestyle of Excessive Generosity, David C. Cook, 2013). This innovative company employs refugees while addressing social needs. Participants will have an opportunity to examine social entrepreneurship first-hand. In the afternoon, the group will visit a local church that has been a hothouse for creative outreach byproviding a location for ministries that meet felt needs in a community. “Urban Ministry: Exploring Poverty, the Church and the City”(Saturday, July 27) led by Moody Bible Institute Associate Professor Clive Craigen will visit two agencies in poor areas of Atlanta. One stop will be at City of Refuge, where participates will see how this organization has turned a donated warehouse into a site that meets needs, provides education, and tends to medical needs of residents. In the afternoon, the group will travel to a community in south Atlanta to visit FCS Urban Ministries (Focused Community Strategies), founded by BobLufton, author of Toxic Charity (Harper Collins 2011). “Discover Atlanta as a Doorway to the Nations” (available all three days) will showcase some of the more “culturally exotic things within a stone’s throw of the Encompass Atlanta offices,” says Ward. The visit will include a stop at the largest Hindu temple in the U.S., a visit to the International Farmer’s Market where produce from around the world is available, and lunch at one of three ethnic sites: Chinatown, a Latin mall, or an Indian mall. Openings are also still available for “Expand Your Religious Worldview – Buddhism (Tuesday, July 30) and a few slots are available for “Jesus and the Quran,” a two-day workshop (Monday and Tuesday) that provides practical ways to build relationships with Muslims and how to share the Gospel with them through the stories of Jesus. Check out the complete offerings at vision2020south.com/conference/labs-schedule. Vision2020 South will be held July 26- July 31, 2013 in Atlanta Georgia at the Atlanta Marriott Buckhead Hotel and Conference Center. For registration, see vision2020south.com.